They're walking among us in Halifax. Look for 20-somethings, two hands on their smartphones, huddled together, excitedly speaking in what seems like another language. They're everywhere. 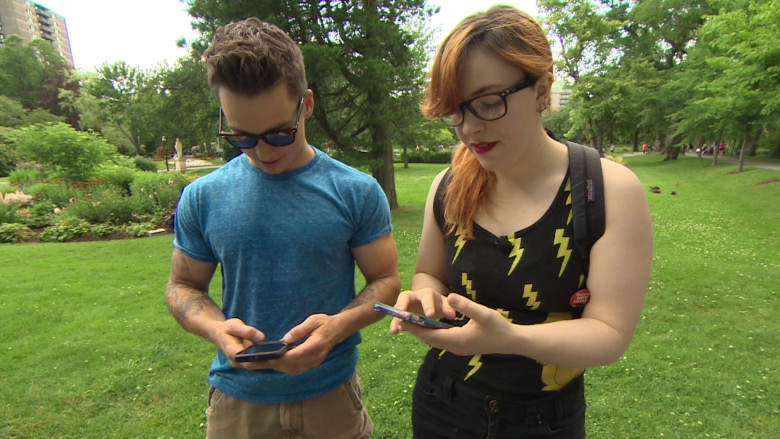 They call themselves Pokemon trainers and they're out to "catch 'em all" — the popular slogan of the original Pokemon franchise that first launched in the '90s. Nintendo, and its partner Niantic, have brought it back in a big way with the mobile gaming app Pokemon Go. It's the latest game in Nintendo's long-running series where players catch colourful creatures called Pokemon and train them to spar with other players. Pokemon Go lets players hunt for monsters in the wild thanks to GPS location data and augmented reality displays on their smartphones. "Eleven-year-old me would be so excited. 'Cause that's, like, what every kid's dream was," said Dakota Lloyd, who had donned a Pokemon tank top that was first traded between her and her friends more than 10 years ago. 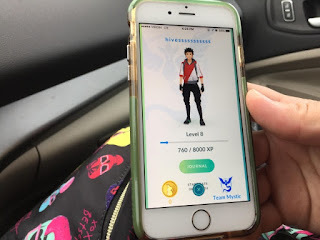 Now, Lloyd is at the forefront ofPokemon Go in Halifax, after being inspired to pick up the game by friends in Australia. That connection was key to her being able to play the game, since Pokemon Go isn't actually available on the Canadian Apple app store. "You go to the app store in the U.S., New Zealand or Australia and you put in a random address, and it'll let you make the account and download it," said Lloyd. Lloyd's workaround, to set up an Australian iTunes account, won't get her in trouble. But there are some risks for Android users who would need to download software to get it, according to tech expert Amber Mac. "There are no real consequences for these workarounds except potentially on Android devices with the software," said Mac. "That could harm your smartphone in the future, so you have to be a little bit careful about that." Rather than risk it, Mac suggests people in Canada be patient. "Canadians should just wait a few days. It is coming to Canada and it's not going to be that long." Const. Dianne Woodworth, with the Halifax Regional Police, has a similar message. "Sometimes waiting is the best thing to make sure you're getting the legitimate app. 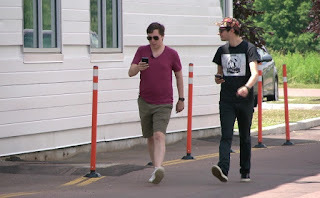 There are also concerns over players' safety, as they explore all corners of the city with their eyes on their phone screen — rather than the roads they're walking. Pay attention and look where you're going. If you're travelling in an unfamiliar area, make sure you tell someone where you're going. As more and more people around the world download the app, tech experts and investors alike are asking if Nintendo has finally cracked the mobile gaming market. Or is this just a one-hit wonder? Nintendo had previously been criticized for being slow to pick up mobile gaming. "They've said that it isn't really a priority for them. I imagine after the success of Pokemon Go that is all going to change," said Mac. 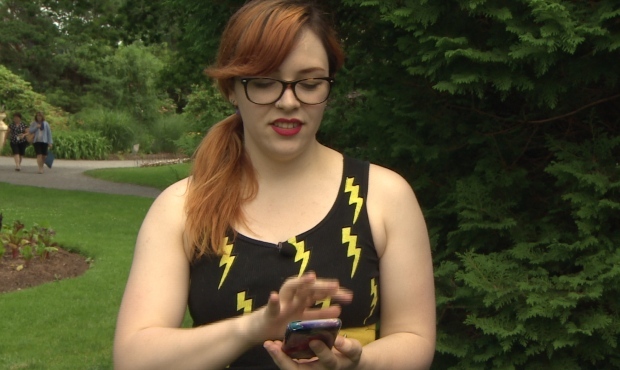 Pokemon trainer Lloyd, who kept catching characters in the app as she spoke with CBC News, doesn't have any plans to put the game down for good anytime soon. "This isn't a fad for me," Lloyd said. "I've been playing this since I was 11 years old.